Education in the U.S. is in crisis. Students who use textbooks and memorize are bored stiff. And the teachers who “teach to the test” feel alienated. The old ways of memorization are useless in the digital age. What is clear is that we need compelling interdisciplinary digital education platforms — for students and teachers — that enhances critical thinking and create engagement. Here are some facts: The U.S. spends $13,000 dollars per year on every one of its 55 Million students in K-12 and that is by far the most spent in the world. But, American students are only 26th in math in the world, 21st in science and 17th in literacy and this disturbing decline continues to spiral. Enter The Madcap Learning Adventure, who recently shared with the Learning Counsel what they have been doing and working on to transform learning. This digital and interactive learning platform is a reimagining the textbook for core K-12 education. 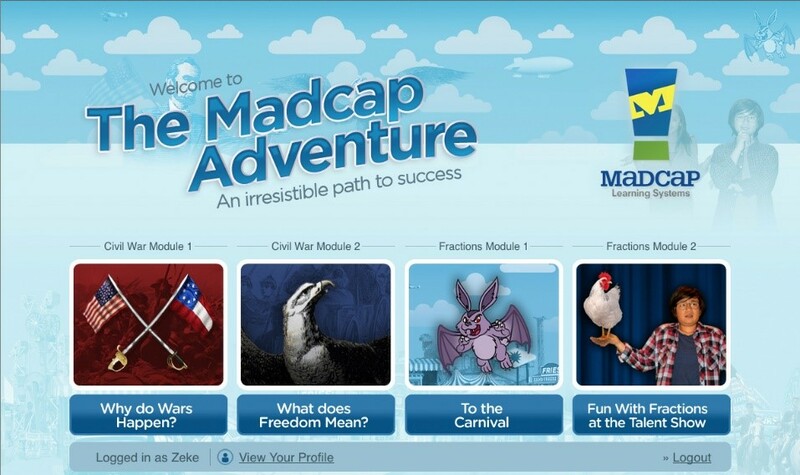 Madcap’s education platform allows the learner to personalize his or her own learning journey with a digital and interactive adaptive module. It creates a non-linear matrix of learning opportunities using the techniques of gaming supported throughout by powerful expressions of the core ideas across the curriculum. Initially funded by The Bill & Melinda Gates Foundation with a strategic investment from Pearson Education of New York, CEO David Devine and his creative and curriculum team are creating a public and private education platform for the digital age. Madcap is 100% web-based that is accessible by all ubiquitous computer devices. The Learning Adventure is not aligned with any single hardware supplier or device. “We believe that as smart phone and tablet technology and computing capacity increases and costs decline, students, parents and teachers will have easy, cost effective access to online curriculum anywhere and at anytime,” stated Devine.